Beautiful upgraded home located on a Cherry Blossom lined Cul-de-sac in the Peppertree neighborhood of Northridge, this property offers 5 br + 3 ba with 2129 sq ft. Main entry leads to a beautiful step-down living room with a cozy fireplace. The newly remodeled open concept kitchen is impeccable with new stainless steel appliances. Newly remodeled bathrooms have high end Vanities, glass shower doors and new custom tiles. Recessed lighting throughout, New French doors, new custom cement in the backyard and in front of the house. Swimming pool has new plaster and new pool equipment. Property has been freshly landscaped and has new sprinkler system. New Plumbing throughout the house with new Tankless water heater. New electrical panel with upgraded 200 amp. New paint inside and out. New engineered laminate hardwood floors throughout the home. The home also features an attached 2 car garage with direct access. Close to shopping, restaurants, parks and freeways. 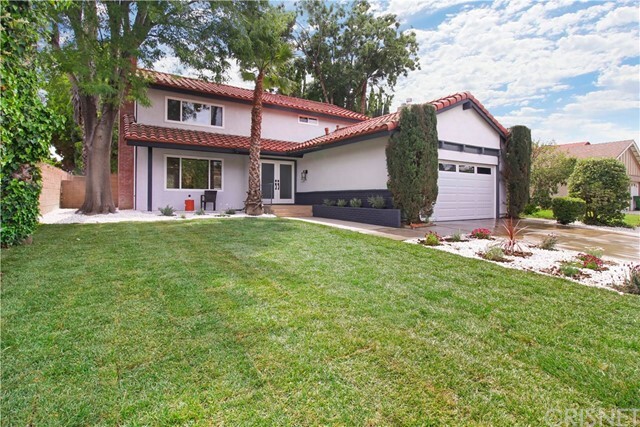 This home is also in the boundaries of Award Winning, Granada Hills Charter High School, Nobel Middle School, and Topeka Elementary School. Listing Provided By Carla Hernandez of Purplebricks Realty Inc.